Pink is a color I love. If you've ever looked at my Pinterest Boards you might have noticed that awhile ago I pinned a pic of a woman with pink hair along with the caption "sometimes I just want to try pink hair." Recently, I had the chance to visit some incredible art galleries in San Francisco. I especially loved Dolby Chadwick. While there, I remembered that color is an important source of inspiration to me (in fact, I've put color on my "Power Up" list--if you have not seen Jane McGonigal's TED talk and you don't have a Power Up list, it is worth the time to watch the talk and make your own list.). I decided to do something "wild" to celebrate his return to Palo Alto from Joplin, MS. Brett always encourages people to think differently, to try out of the box things so it seemed perfect to run the experiment to celebrate his milestone. I've learned a couple things from running this experiment. 1. Color truly is a "power up" for me and having a streak of pink hair is a fun mood boost. 2. Most people are very civilized in sharing their opinions. I'm finding that so far, everyone is following the "if you don't have something nice to say, don't say anything at all," adage. Most people seem to get a little "fun" boost out of watching me do this. 3. This is not nearly wild enough. 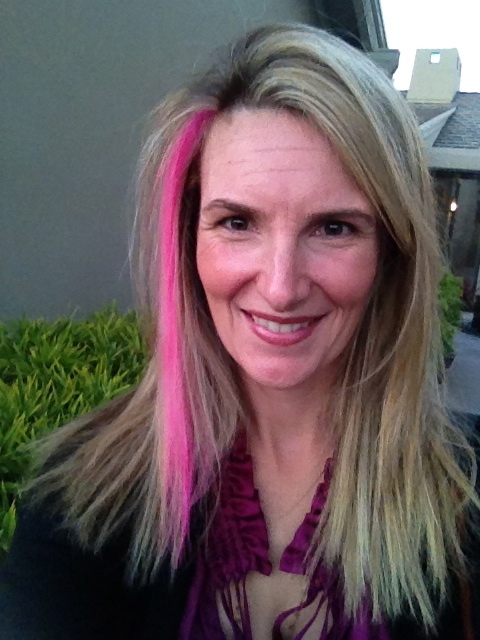 Getting a pink streak in my hair felt like it was out on my edge, but I think I have farther to go. I think Brett would agree. Stay tuned!